With the MailChimp email marketing integration you can connect your Back in Stock account to your MailChimp store mailing list. Customers can opt-in to your mailing list at the same time as creating a Back in Stock notification. It is simple to setup and you can select which mailing list new customers are added to. Once you setup the MailChimp integration a mailing list ‘opt-in’ checkbox will be added to your Back in Stock signup form. 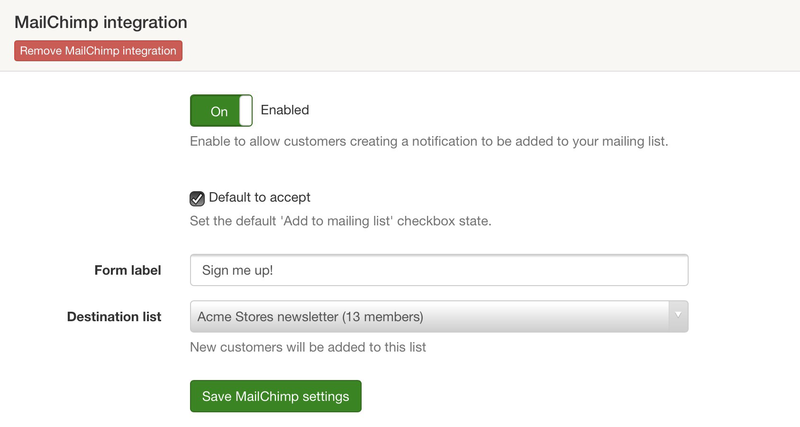 Customers who create a Back in Stock notification with the opt-in box checked will be added to your MailChimp list. From the list of integrations choose MailChimp and click Add. You will be redirected to your MailChimp account and asked to login. From the Destination list dropdown choose the MailChimp list customer email addresses should be added to. Hit Save MailChimp settings to save your changes. Click Modify next to the MailChimp integration. You can toggle the enabled setting to off to disable MailChimp. When set to off subscribers will no longer be sent to your mailing list. Choose which MailChimp list Back in Stock will add subscribers to. To disconnect your Back in Stock account from MailChimp and delete your settings click Remove MailChimp integration. Your subscribers in MailChimp will not be affected. Customer notifications aren’t being added to the MailChimp list. Check you’re using a real email address to test with which is not a current or past subscriber. If you have multiple fields set to ‘required’ iny our list the subscriber will be rejected. Make sure your list only has email as a required field. After you have enabled your MailChimp integration simply install the theme integration again. The theme snippet will be updated to include the opt-in checkbox. Do I need to connect to MailChimp to use Back in Stock? No, the MailChimp integration is entirely optional. The MailChimp integration is only used to add customers to a MailChimp list. Customer notifications are still sent by Back in Stock.